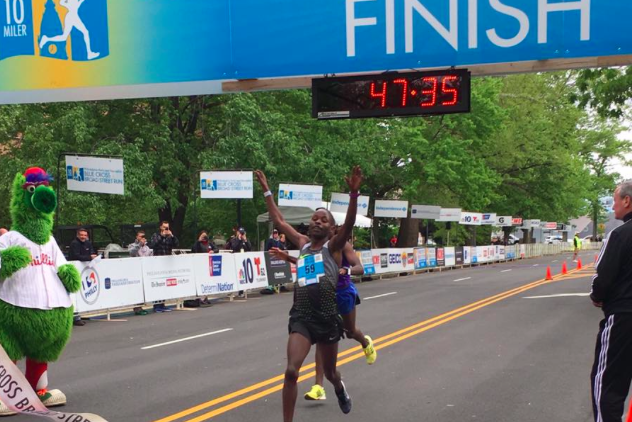 Dominic Korir of Kenya finishes first at 2017 Broad Street Run. Final results are officially in on the 2017 Broad Street Run, the 38th annual event that propels some 35,000 participants on a 10-mile through the neighborhoods that surround Philadelphia's main thoroughfare. The course began at 8 a.m. Sunday at the Central High School Athletic Field, proceeding all the way down to the Philadelphia Navy Yard in South Philadelphia. Coming in first place overall this year was Dominic Korir, 23, of Kenya, with a finish time of 47:38—good for 4:45 seconds per mile. Second place went to Philip Mburu, 27, of Minneapolis, at 47:39, while third place went to Mengistu Nebsi, 39, of New York City, with a time of 47:45. The first Philadelphian to place was Patrick Ritchie, 26, who came in at 10th with a time of 49:44. Among women, first place was won by Askale Merachi, 30, of Ethiopia, who finished at 53:49. Second place went to Serena Burla, 34, of Stafford, Virginia, who time in at 54:30. Zipporah Chebet, 28, of Chapel Hill, finished third with a time of 56:16. Here's a look at some of the sights from Sunday's race, whose chilly temperatures and overcast sky were an improvement over last year's slippery conditions.